Tom Hoppel may best be known as one of the most highly regarded Yoga Teachers in all of Europe, however his leadership does not stop at the doors of his Yoga studios, he is a passionate and established human rights advocate having led HMF activities and events in Hungary since 2011. Tom has worked alongside HMF co founder, Stuart Milk, on the ground in Hungary counter messaging the hate and diminishment that a growing number of extreme right groups have promoted. 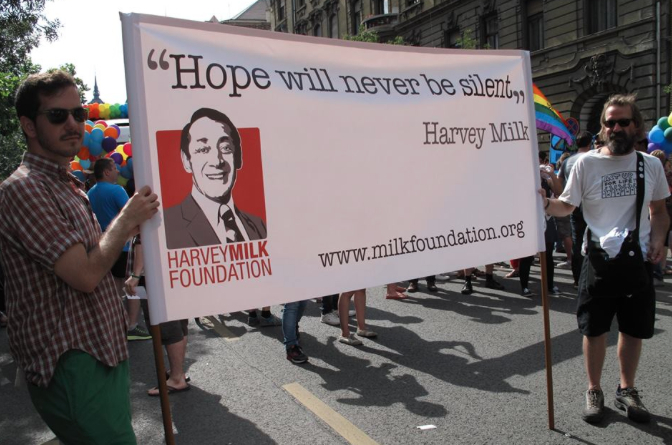 When Stuart Milk first stood up to the ultra nationalist forces in Central Europe that began attacking LGBT, Roma, women, Jews, Muslims, and Immigrants, it was Tom who was right there standing with Milk and then following through to keep the hope alive throughout the region. You can read more about the Foundation’s work in Central Europe and our inspiring friendship and mentorship with Milan Rosza and others leading the Hungarian civil society community on our new media pages.